As the commander of a two man recon team, the player enters a mysterious sci-fi adventure and a tale for survival in an unknown planet. A routine maintenance operation goes terribly wrong when an alien substance appears and the players passes out, waking up on an alien planet, without knowing what happened. The screams of your partner are indicative that he is in no better shape. Now, the player has to explore the alien landscape in this upsetting freeware adventure game. With a first-person view from the commander’s helmet, Egress: The Test of STS-417 better evocates the feeling of loneliness and dread. 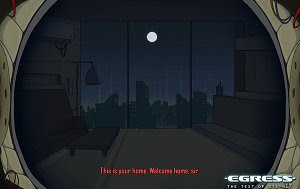 The game features hand-drawn graphics and some 2D animations, using some haunting music to great effect. The gameplay will be familiar to point and click fans, with an inventory to store items and some puzzles that aren’t particularly demanding. It’s also a nice touch that there are different choices and different outcomes to the adventure.